A call to Greg Marino at Neff Yacht Sales brings more information about his new central listing, Cheoy Lee's 27.4m motor yacht Exit Strategy. Apparently she's a sheep in wolf's clothing with her husky workboat exterior but lighthearted, warm interior designed to combine comfort and luxury. There's a large main deck saloon aft, adjacent to a dining area. A skylounge is aft of the pilothouse, followed by an entertainment area with an electric grill, wet bar and built-in seating area. Below decks accommodation includes four staterooms plus crew quarters. The master and VIP suites are aft and the two guest staterooms are forward along with the crew quarters. 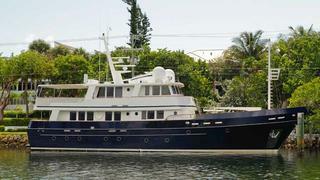 Designed for long passage-making in either arctic or tropical seas, Exit Strategy is asking $2.649 million.